Cincinnati is the third largest city in Ohio and the Greater Cincinnati Metropolitan area covering Ohio, Kentucky and Indiana is the largest metropolitan area in Ohio and the 27th largest metropolitan in the United States. The Greater Cincinnati area has a unique variety of architecture and the homes offered in Cincinnati are no different in their unique style and features. 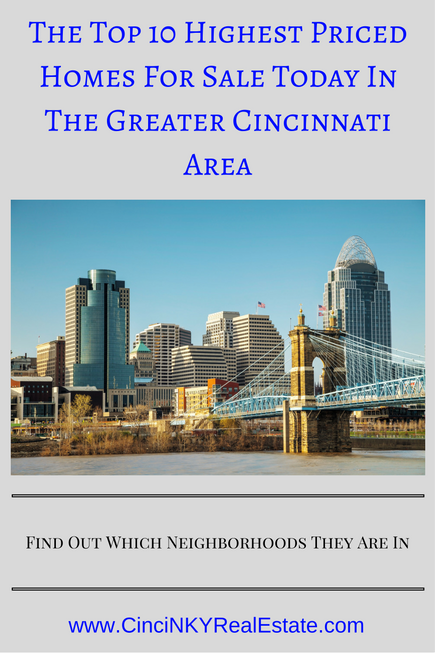 You can find 100+ year old one of a kind homes in different neighborhoods in Greater Cincinnati as well as brand new homes with modern design. What began as a farming community in 1904 the Village of Indian Hill later was reshaped into more of an area for large estates. The homes in Indian Hill represent some of the best of what Cincinnati has to offer. In 2002 the Robb Report rated Indian Hill, OH as one of the best places to raise a family. Of the top ten priciest homes in the Greater Cincinnati area Indian Hill has 7 homes on the list. When buying a luxury home, buyers will want to take the path of least resistance in order to make the process easier to deal with. The last thing luxury home buyers will want to do will be to rush through a purchase and find out the home they bought is more trouble than it is worth. 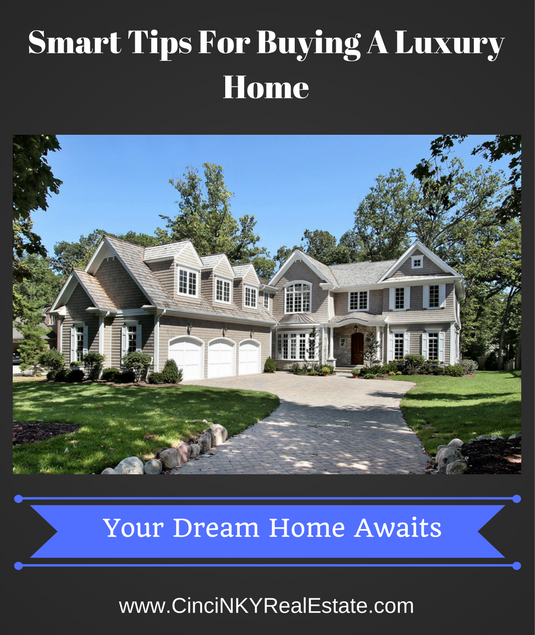 Luxury homebuyers can ensure their purchase of a luxury home is a sound and smooth decision by using the tips below. Just because a home has a “luxury” price while it is on the market does not necessarily mean the home is a true luxury home. A small house that may look great and be considered luxury in a densely populated city may instead be considered a luxurious tiny home in another area where land is plentiful and therefore homes are expected to have plenty of square footage in addition to other luxury features. The small luxurious house in an area with large luxury homes would not be able to get the same price as large luxury homes since home buyers in those areas want the extra space and that is the primary reason for them shopping for homes in an area with plenty of land available. Generally luxury homes are located where other luxury homes are situated and as a result the prices of those homes have a tendency to support other luxury homes close by. Luxury homes have extra refinements that put them into a category of their own. Luxury features such as premium brand appliances, premium cabinetry, carpet, and flooring are often found in these homes. These premium features usually have better build quality associated with them in addition to longevity. For this podcast about Jumbo Mortgages for purchasing a luxury home I sat down with Walt Wollet of Summit Funding. During our conversation we discussed the jumbo mortgages, the application process, credit score and down payment requirements and more. This podcast is helpful for those wanting to buy a luxury home through the use of jumbo mortgage financing. You can connect with Walt Wollet on LinkedIn, Facebook, and at SummitFunding.net. Purchasing a luxury home requires a slightly different approach than if one were buying a non-luxury home. Generally a luxury house is considered luxury because the price is higher than $500,000.00 and offers luxury amenities not commonly found in non-luxury homes. While the $500,000.00 is a general guideline that does not mean that amount applies the same to every area in classifying a home as luxury. In the Greater Cincinnati, Ohio and Northern Kentucky Real Estate Market homes $500,000.00 and above generally will be considered to be luxury homes. Other areas may be different based on the real estate market in those locations since real estate is all about location. 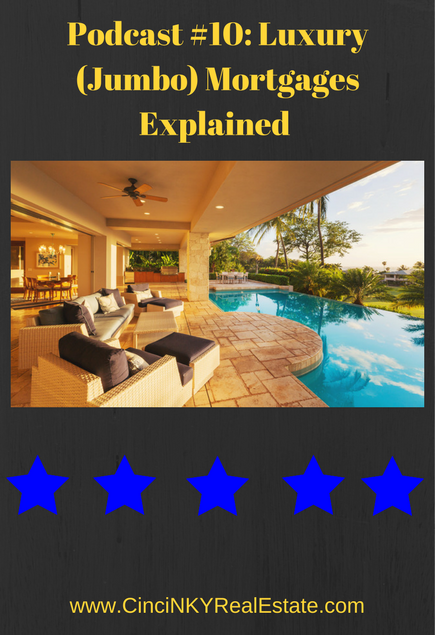 If you plan on purchasing your luxury home with cash then this may not apply to you. However with mortgage interest rates as low as they are, borrowing money to purchase your luxury home while at the same time using your cash in different higher rate of return investment may make sense for you. Additionally you may qualify for the mortgage interest tax deduction which could reduce the amount of taxes you owe each year you pay interest on your mortgage.